Brookline High School has moved on to the quarterfinal round to compete against Lexington High School on WGBH’s “High School Quiz Show.” Brookline defeated Needham High School in the first round on February 11, 2017 with a final score of 435-415 after a tie-breaker round. The episode will air at 6:00 p.m. April 1, 2017 on WGBH 2. “High School Quiz Show” is a seeded, single-elimination tournament is produced and broadcast by WGBH and hosted by Billy Costa. 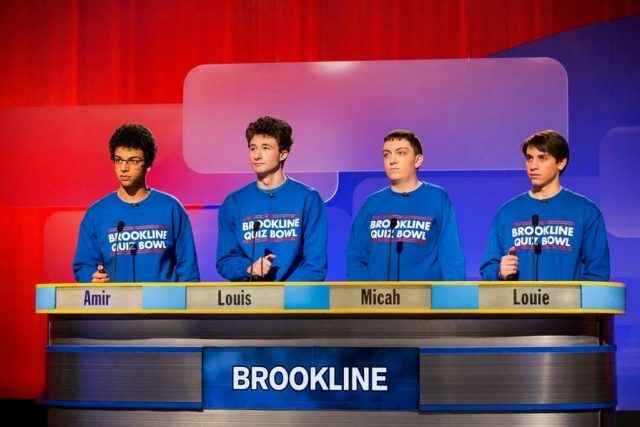 Sixteen teams of Massachusetts high school students advanced from a pool of more than 110 schools to compete in the televised academic tournament. The 16 schools competing on “High School Quiz Show” earned the highest scores on an identical oral quiz at WGBH’s “Super Sunday” qualifying event at WGBH studios in Brighton. The season eight field includes four past champions and two schools making their first appearance in the tournament. The other matchups include Hingham High School vs. Somerville High School, on April 8; Chelmsford High School vs. Newton North High School, on April 15, 2017; and Advanced Math and Science Academy vs. Thayer Academy, on April 22, 2017.